I came to Tuckahoe Plantation to look at the cabins. Drawings for them are in the HABS archives. 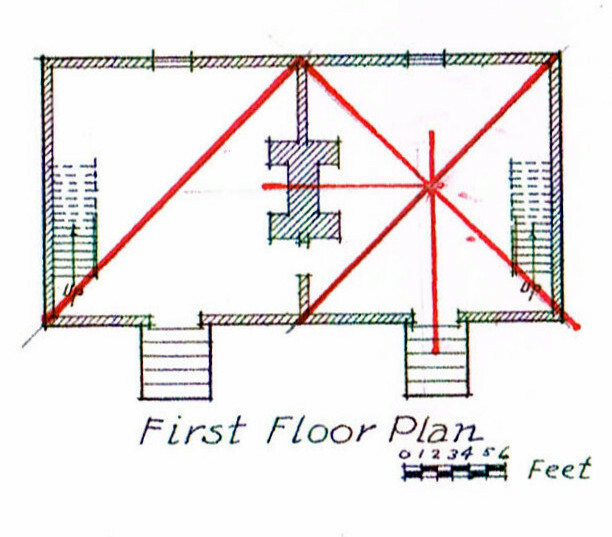 They are the size and layout of the houses whose floor plans Henry Glassie recorded and whose geometry I have written about. Dr. Glassie's book, Folk Housing in Middle Virginia, includes photographs of poorly maintained houses, most beyond repair. understanding. I need to see the building. It is very simple. in appearance and geometry, and not only because of its shape and lack of anything beyond the essentials. It is just squares: 2 across the front, 2/3 of a square for the sides, 2 for the floor plan. The chimneys are centered on the square. 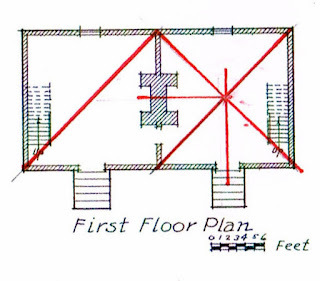 The doors and windows are centered on the plan and on the center of the square for the front elevation. 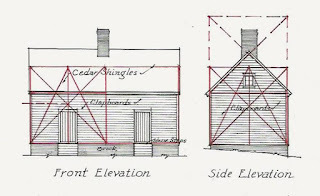 The front and side elevations are two thirds of the square. The roof pitch is 12/12 - the diagonal of the square - and begins at the 2/3 line of the lower square. This way of dividing a square and using the diagonals to determine dimensions is called the Rule of Thirds. 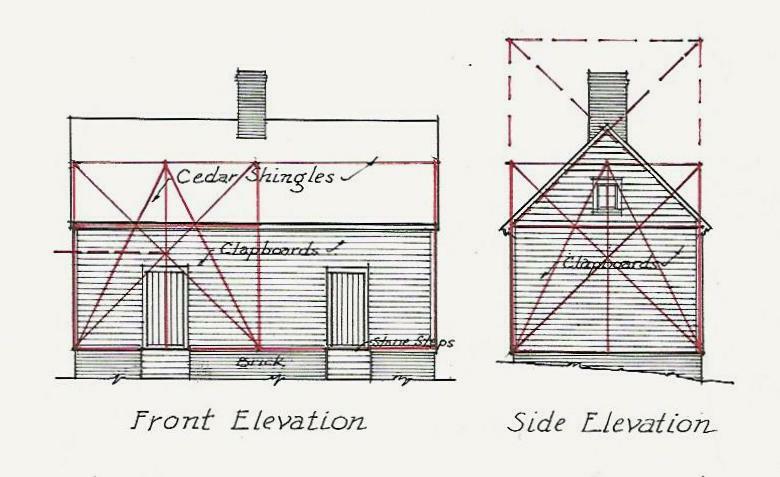 The book, The Chesapeake House, reports that the plastered interior walls of the house are original as is the door between the two rooms. 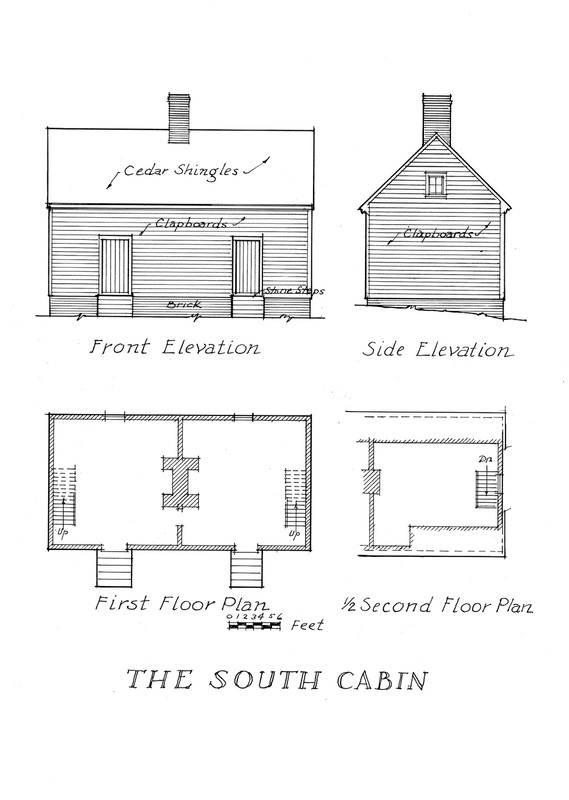 This 'cabin' then perhaps was built for the use of an overseer, or craftsman. As you can see from my photograph, the little house sits on a green lawn with a dirt path, surrounded by towering leafy green trees. 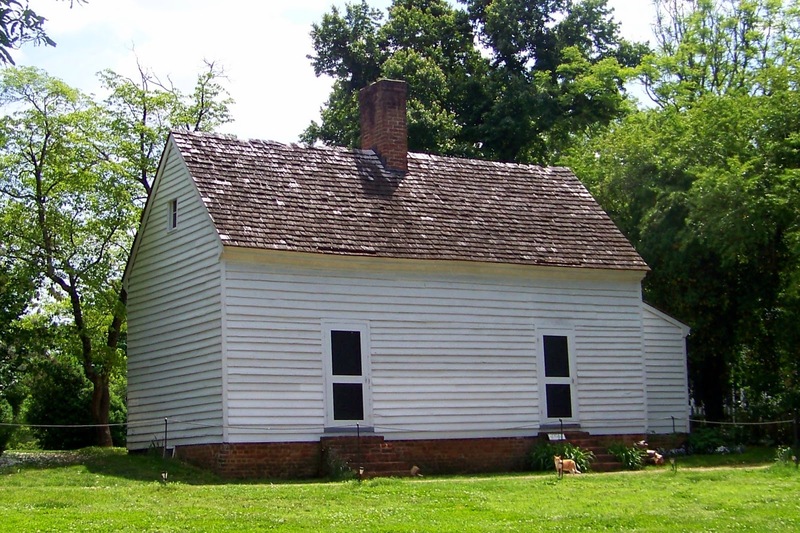 Clean white paint, variegated wood shakes on the roof, a neat brick chimney - all in excellent condition - may give too cheerful an interpretation of conditions in 1750, but I am glad it is being preserved. 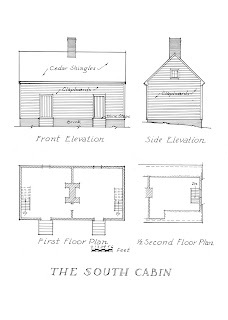 Studying the adjoining kitchen, office and storehouses, walking down the path, then around behind the cabin across the lawn to the main house, gave me enough understanding so that as I traveled back roads to Madison's Montpelier I easily spotted similar cabins, now out-buildings on farms or wings to later homes. At Montpelier, where timber framed and log cabins are being rebuilt, I was also able to better read what was there. My visit to Tuckahoe was excellent. The Chesapeake House, architectural investigation by Colonial Williamsburg, edited by Cary Carson and Carl Lounsbury, The colonial Williamsburg Foundation and the UNC Press, Chapel Hill, 2013. I have deleted your comment, michael. It is irrelevant. While your plantation is most likely a beautiful place, I am writing about construction technology and design.